Take that along with the competition from the iPad and Amazon should see its Kindle sales drop quickly without a significant move on their part. Amazon, it’s your move. 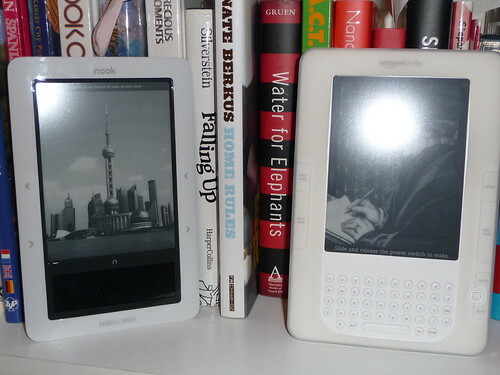 If you don’t hurry I see the Nook taking the e-reader niche away while Apple gets the rest. And just a few hours later Amazon did the best thing they could to stay in the competition – they lowered the price of the Kindle to $189 – just $10 less than the 3G + Wi-Fi version of the Nook. Still $40 more than the Wi-Fi only version of the Nook though so I see them losing the overall price battle until they add a Wi-Fi only version and add Wi-Fi to the 3G Kindle. But at least they are paying attention. Now lets see what new hardware Amazon can give us – I personally think a Wi-Fi only version is the next obvious step.